I tested this in both vSphere 5.0 and vSphere 5.1, and got the same results. 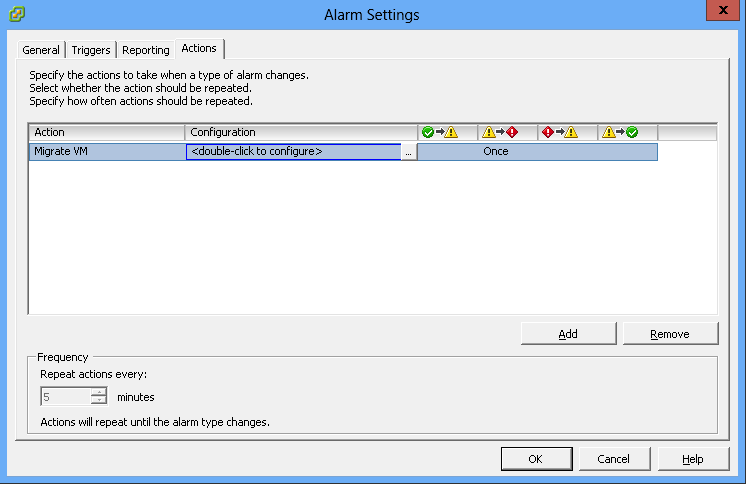 I created a new alarm, and set the action as Migrate VM, and clicked <double-click to configure> that is displayed in the following diagram. Then I chose the host that I want the VM migrate to, once I clicked the Next button the Error windows pop up. I opened a ticket to VMware. Ironically, the support technician experienced the same issue in their vSphere 5.5 environment. Per him, the only solution is to use the web client (vSphere 5.1 and later version only). As they have stopped developing C# client, the bugs won’t get fixed. The error that I found in the vSphere client log is the vmodl mismatch between the server and the client.